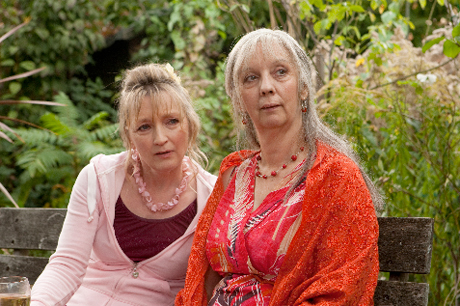 Ever the commentator on class system dichotomies, featuring contradictory people awkwardly existing in the vacuum of social niceties, Mike Leigh has again crafted an unforgettable character in Lesley Manville's Mary, a jittery, yammering, alcoholic administrative worker nearing 60 with only a crappy used car to show for it. As chatty and seemingly optimistic as Happy-Go-Lucky's Poppy, she exists on the opposite side of the cultural divide, being the kind of person that takes rather than gives. Here, she takes from psychiatrist colleague Gerri (Ruth Sheen), whose kind dinner invites are met with a drunken Mary slobbering on about her desirability and the men that got away from her. Gerri's husband, Tom (Jim Broadbent), can be somewhat tactless, but our booze-soaked protagonist barely notices. As the title suggests, the movie unfolds over a year in four seasonal sections, giving Mary an opportunity to hit on the happy couple's adult son Joe (Oliver Maltman) and insult his girlfriend. Since her actions are rarely flattering or affable in any way, it's a testament to Manville's intense commitment to her character that she comes off as strangely pitiable and pathetic. Some might laugh at her awkward assertions of success and embarrassing drunken speeches, but there's an intense sadness underneath her constant desperate questions and relentless neediness that is overwhelmingly poignant. When Gerri and Tom invite their similarly lonely friend Ken (Peter Wight) to visit, he expresses an interest in Mary, seemingly being an ideal suitor, himself drinking and eating his weight in emotional turmoil. But, of course, the mirror proves unflattering, leaving her to sponge off those whose stability and happiness she desires, but can't have. Unsurprisingly, the performances and dialogue are what make this mostly uneventful movie shine, which is typical of all things Mike Leigh. What's interesting here are the social implications that suggest that those married, educated and professionally employed deserve the contentment their lives afford, needing only to fend off those they help, who secretly want to steal their lives.